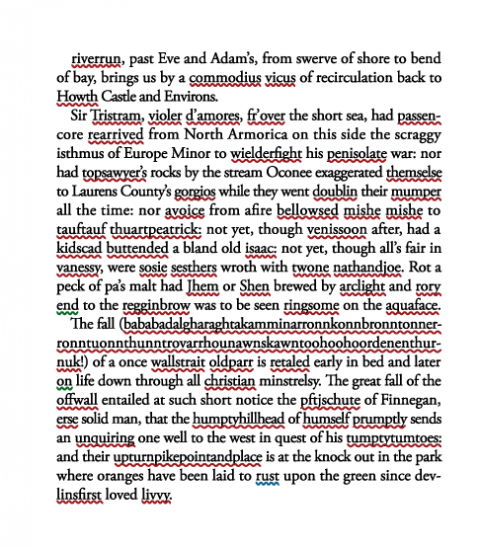 But I digress: why don't readers even give Finnegans Wake a shot? The illustration above perhaps says it all. The web site stammpunct.com has created a visual showing what happens when you run a page of the novel through a spell checker. It yields a lot of red, and then some more red. A framable print of this visual can be purchased at stammpunct for $35. Copies of Ulysses and Finnegans Wake can be downloaded from our collection of Free eBooks. And you can hear James Joyce reading ‘Anna Livia Plurabelle’ from Finnegans Wake here. It was recorded in 1929. I’m amazed it was published in that state. $35 for the print would be “buttended” enough, but it’s actually $50. Was this author executed for his crimes, or did he receive medical care? If I recall correctly, Joyce wrote Finnegan’s to be akin to the dream state of consciousness. Scott, you recall correctly. Ulysses was to be the book of the day, Finnegans Wake the book of the night. It’s also meant to encode a number of myths through the language instead of just through allusion and allegory. It’s also meant to be read aloud; many of the double (triple, more) meanings are aural as well as visual. no , he was immortalized with bronze statues and countless discussion. He spend 17 years on this. Any geek can spell.